It's time to get your (simple) groove on. Before you can hope to get your sample-based drum kit parts sounding like the real thing, you need to master the basics of beat construction, and in this walkthrough, we're going to help you do just that. Starting right at the beginning, we'll lay out a very simple kick/snare/hi-hats groove in four simple steps. 1. Getting a basic kit pattern started is very easy. Here, we're drawing kick drum hits on quarter-notes 1 and 3, and snares on quarter-notes 2 and 4. If we copy that out through a four-bar section, believe it or not, that's the basic rhythmic 'skeleton' of the vast majority of contemporary music. 2. The hi-hats 'ride' over the top of the kick and snare, and usually comprise straight eighth- or 16th-notes. The latter are played two-handed, with the snare hit replacing the hi-hat on the backbeat rather than being concurrent with it. With no velocity variation, the hi-hats sound robotic, but we'll return to that in the next section. 3. 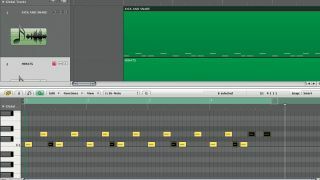 Returning to the kick, we now add some variation in the form of an eighth-note hit before the second kick of each bar. We also add extra hits to the snare pattern at the end of every fourth bar, on eighth-notes 6 and 8. This second change creates a sense of repetition every fourth bar. 4. Our final basic element is a crash cymbal, which we put on the downbeat of bar 1. However, we want this to happen every eight bars, so we need to repeat our four-bar section as well. So we now have the syncopated snare adding internal repetition every four bars and the crash marking every eight bars. Congratulations - you've made a basic beat!